NHL training camps aren't scheduled to open for another month, but Nail Yakupov isn't ready to wait that long. Yakupov, the first pick in the 2012 NHL Draft, arrived in Edmonton this week ready to prepare for the start of his first professional season. "I started working out with the guys," he told reporters Thursday. "Just seeing my place and just be here. There's nothing to do in Russia. Just have to start work and get ready for camp." Yakupov had 31 goals and 38 assists in 42 games last season with the Sarnia Sting of the Ontario Hockey League. He also helped Russia win the silver medal at the IIHF World Junior Championship, leading to the Oilers selecting him with the first pick in June. He got an early start to his season by participating in the Canada-Russia Challenge, which ended earlier this week after two games in Moscow and two games in Halifax, Nova Scotia. The games were a celebration of the 40th anniversary of the famed 1972 Summit Series, as well as a tribute to the Yaroslavl Lokomotiv team that was wiped out in a plane crash last year. "It was tough because it's the first games in the season, you're playing against Canada," he said. "It was two different games in Russia and Canada because we have the big rink [in Russia] and Canada has the small rink. But it was fun. We play for the fans, and we play for Yaroslavl." With that over, Yakupov is starting to learn his new NHL hometown. He said he's looking for a place to live for himself and his family, which will spend the season in Edmonton with him. "I think it's better for me," Yakupov said. "I can speak the Russian language and have Russian food here. Best people in the world around you and they help you a lot. I think it's great." He's also getting used to life in what for him is a big city. "For me it’s a big town," he said. "I live in a small town in Russia, and Sarnia, so for me this is huge. I love Edmonton so it's good." What also is good for him is getting to know his new teammates and coaches, another reason he's come to town so early. 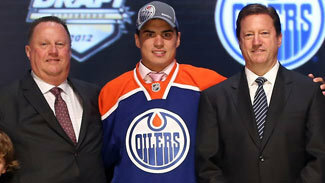 "I just see [Ryan Nugent-Hopkins] after the draft," Yakupov said. "I talked to Sam Gagner after the draft, but we'll see who's in the gym or on the ice. … I want to play in the NHL and be ready for the NHL, that's why I'm here early to start practicing."